When a baby boy in Washington was born, doctors told his parents that he had a rare skin disease and gave the newborn no chance at survival. The rare disease is called harlequin ichthyosis and about 1 out of every 500,000 babies are born with the disease. Baby Jamison Stam must take painful bleach baths every week just to stay alive and stave off infection which he is highly susceptible to. Jamison's 27-year-old mother Alicia Barber was told in 2013 that she was infertile due to endometriosis. But a surgery in 2016 corrected the problem giving her the ability to conceive again. Barber found out she was pregnant with twins in October of 2016 but one child was absorbed during her pregnancy and the doctors told her the other baby would not survive. But Jamison Stam was born in May 2017 and despite the death sentence doctors said was inevitable, Jamison is still alive today. His survival is largely attributed to his twice week bleach baths which his mother must administer just to keep him out of the hospital with life-threatening infections. About 7 babies are born each year with harlequin ichthyosis in the United States. The disease is characterized by thick plate-like scales of extra skin that pull really tight and result in large cracks between the diamond-shaped chunks of skin. Babies may also have stretched eyelids, swollen hands and feet, and difficulty breathing. 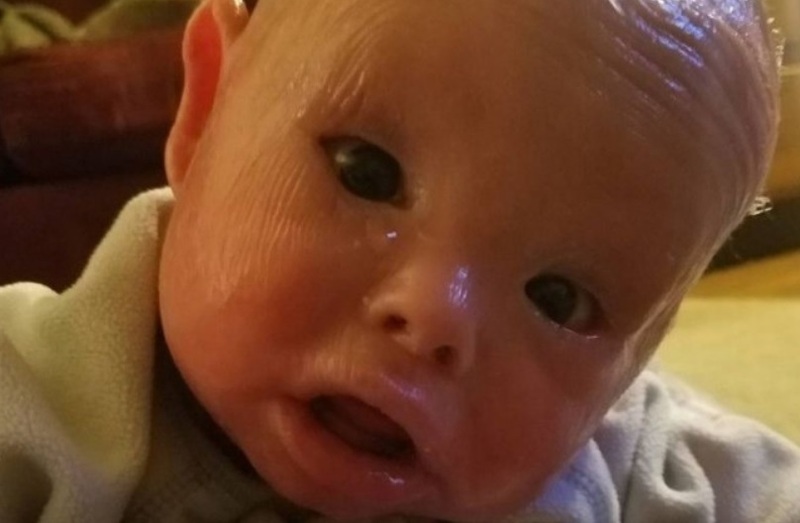 "I had never heard of Harlequin ichthyosis before the doctor took me aside and showed me a textbook with pictures of babies with this condition," Barber said. "They had no faces, no hands, no feet and no fingers and toes." Although the prognosis left Barber depressed, she refused to give up and dedicated her life to her newborn son. Jamison requires round-the-clock care from his mother and he requires special care since his skin can't handle any harmful bacteria. Doctors recommended bathing Jamison in two 45-minute bleach baths every week to keep him clean and kill any bacteria. His mother must also use a sandpaper rag and an exfoliating mitt to bath him. The baths were so painful for Jamison that they had to give him morphine which helps with pain but made breaching even more difficult for him. "Some days I wake up and I think how am I going to get through another day," Barber said. She has <a href="http://www.techtimes.com/articles/230867/20180621/mom-gives-1-year-old-baby-painful-bleach-baths-because-of-a-rare-skin-condition.htm">set up a GoFundMe page</a> to raise funds to allow her to attend a national conference for harlequin ichthyosis in Nashville to help provide insight on how to care for Jamison.